Voyage plans update. – Dirty wet dog , boats and sailing. 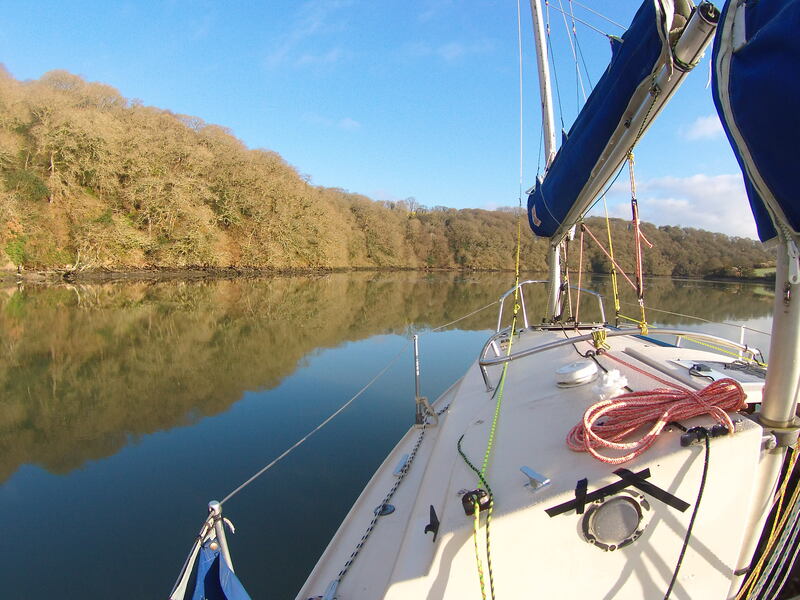 My latest trip to the Fal river seemed to be the first time during the voyage so far that i actually got to stop , actually stop and not just shelter from yet another gale and keep an anchor watch or fret about making a tide but stop, and just relax on the boat. It was the first time also that i didn’t immediately start attending to the myriad small jobs that still need doing or planning further modifications, ok so i took all the cushions out, aired the bedding and had a clean-out but that is just the housework !. The boat is in Mylor and apart from the drive i like it there, there is always activity at the yard and of course its a whole new cruising ground to explore and so far i have only been up the Fal and Truro rivers and poked into a couple of creeks so i have lots to do there yet. At the moment i am planning to stay at Mylor for 6-8 weeks before i move west again and maybe into the Helford river. At some time before midsummer i want to get around the Lizard and base the boat as far west as i can without falling off the end and have a go at getting out to the Scillies in the summer. If that works out it could be then logical to run up the north Cornwall coast and maybe aim to get into Bideford for the autumn, i think though that this year i will reverse my route and have an autumn cruise back along the south Cornwall coast and come back to the Calstock boatyard…..the boat won’t have been out of the water properly then for a couple of years and it would be a good opportunity to do the bottom, empty the boat right out and maybe try and polish up the gelcoat. I am just about getting the idea with filming and editing now with the second video out yesterday, that one is out of sequence as i had already shot some film of the day cruising on the Fal and i edited the paddling footage first just to play around with more of the editing tools : that one took about 5 hours to make a 10 minute clip ! and then an hour to render and 3 hours to upload. The result is i think better than the first attempt but i still have a long way to go : i’ve got a good microphone now and have learnt to narrate in just short chunks, throw some music in and try and make the film clips flow a bit. I had hoped to be working with a DSLR this month but the car MOT fail put paid to that. Later this week i will try and edit the cruising footage and see if can take the whole thing up another notch.